Spine deformities, such as kyphosis (or “hunchback”) and idiopathic scoliosis, are made distinctive by an abnormal curvature in the spine. Children with such spinal deformities are essentially advised to wear a brace that can be fitted around the torso and hips to rectify the abnormal curvature. It has been demonstrated that bracing prevents progression of the abnormal curvature and avoids the need for surgery. The basic technology for bracing has not essentially changed in the last five decades. Although bracing has been found to prevent the progression of abnormal spine curvatures in adolescents, prevalent braces inflict many restrictions due to their static, rigid, and sensor-less designs. Moreover, they are uncomfortable for users to wear and users could suffer from skin disintegration due to prolonged, excessive force. Furthermore, since the users are unable to control the correction offered by the brace, it is difficult for them to adapt to changes in the torso during the treatment, which leads to a reduction in effectiveness. In order to overcome these deficiencies, researchers at Columbia Engineering have developed an innovative Robotic Spine Exoskeleton (RoSE) that might sort out majority of these limitations and give rise to new treatments for spine deformities. 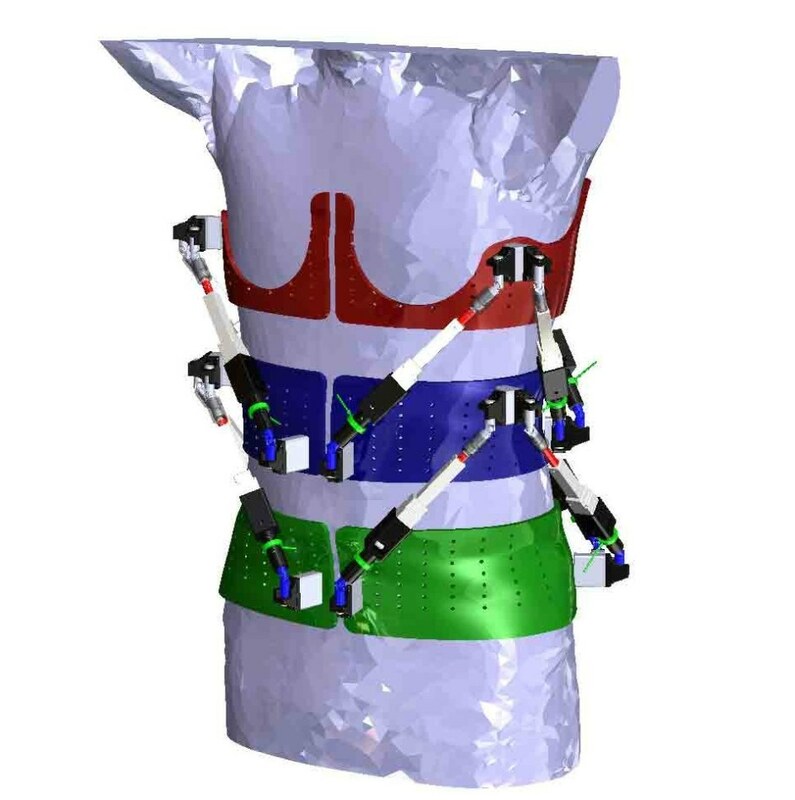 Being a dynamic spine brace, the RoSE allowed the team to perform the first study that involves observing the in vivo measurements of torso stiffness and characterizing the three-dimensional stiffness of the human torso. The research has been reported online in the IEEE Transactions of Neural Systems and Rehabilitation Engineering on March 30, 2018. To our knowledge, there are no other studies on dynamic braces like ours. Earlier studies used cadavers, which by definition don’t provide a dynamic picture. The RoSE is the first device to measure and modulate the position or forces in all six degrees-of-freedom in specific regions of the torso. This study is foundational and we believe will lead to exciting advances both in characterizing and treating spine deformities. The RoSE was created in Agrawal’s Robotics and Rehabilitation (ROAR) Lab and includes three rings that are positioned on the pelvis, mid-thoracic, and upper-thoracic regions of the spine. A six-degrees-of-freedom parallel-actuated robot controls the motion of two adjacent rings. On the whole, the 12 motors in the system control its 12 degrees of freedom. The RoSE has the ability to control the motion of the upper rings relative to the pelvis ring or exert controlled forces on these rings while in motion. The system also has the ability to apply corrective forces in particular directions while still ensuring free motion in other directions. The pilot study involved two male subjects with spine deformities and eight healthy male subjects, and it was designed to outline the three-dimensional stiffness of their torsos. The scientists used the RoSE to control the orientation/position of particular cross-sections of the torsos of the subjects while measuring the applied moments/forces at the same time. The results demonstrated that it is possible to characterize the three-dimensional stiffness of the human torso using the RoSE and that the torso stiffness characteristics induced by the spine deformities are considerably different from that of the healthy subjects. Since the spinal abnormal curvatures are three-dimensional, the stiffness characteristics are curve-specific and are dependent on the locations of the curve apex on the human torso. Although the pilot study involved the use of a male brace designed for adults, Agrawal and his colleagues have designed a brace for girls beforehand due to the fact that idiopathic scoliosis is 10 times more common in teenage girls when compared to boys. The researchers have been actively recruiting girls suffering scoliosis to characterize the variations in torso stiffness following such a medical condition. “Directional difference in the stiffness of the spine may help predict which children can potentially benefit from bracing and avoid surgery,” stated Agrawal. The National Science Foundation (NSF) National Robotics Initiative funded the study under the project “Dynamic Braces for Quantification and Treatment of Abnormal Curves in the Human Spine” (NSF IIS-1527087).